The Aqua Medic Aquaspoon is a scale designed for measuring chemicals and other additives for aquariums. How are you supposed to measure you aquarium additives? Quite often aquarists just grab something from the kitchen (or eyeball it). Once used for aquarium additives one can feel uncomfortable using the cooking container for measuring food again. 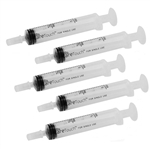 These affordable plastic 10 ml Measuring/Dosing Syringes are the solution when you need to measure small amounts (for larger amounts use the 50 ml Measuring Beaker). Each Beaker has a marking for each increment of .2 ml as well ask markings for every half teaspoon (up to two tsp). This Aquarium Additive 4 Litre Measuring/Mixing Container can be used for measuring larges amounts of aquariums additives or used for using the Blue Life Regeneration Kits. For measuring smaller amounts of additives you might consider the Aquarium Additive 50 ml Measuring Beaker 5 Pack or the Aquarium Additive 10 ml Measuring/Dosing Syringe 5 Pack. These affordable plastic 50 ml Measuring Beakers are the solution. Each Beaker has a marking for each increment of 10 ml as well ask markings for every half fluid ounce (up to two fl. oz.). For measuring smaller amounts of additives you might consider the Aquarium Additive 10 ml Measuring/Dosing Syringe 5 Pack. When precision matters, the Seachem Digital Spoon Scale is the perfect companion tool for the serious aquarist. Accurate and easy to use, it will ensure precise dosing of any chemical or supplement up to 300 grams in 0.1 increments. This Tolco 1 Gallon Plastic Jug Pump can be used with most gallon (and 4 liter) jugs of aquarium additives. Each pump will give you approx. 1 ounce of liquid. Some products you might use with with are the Copper Power, Marine Copper Treatment, 1 gallon 1 oz Per Pump, Kordon NovAqua 1 Gallon, Two Little Fishies AcroPower, 1 Gallon and Seachem Prime, 4 liter. You can also use this with most 1/2 gallon and 2 liter jugs if you cut the bottom of the plastic tube (garden shears will do the job).